Rio New. Salt cleaner for coffee machines and espresso machines. HomeProductsCleanersCoffee machinesRio New. Salt cleaner for coffee machines and espresso machines. Rio New. Salt cleaner for coffee machines and espresso machines etc. 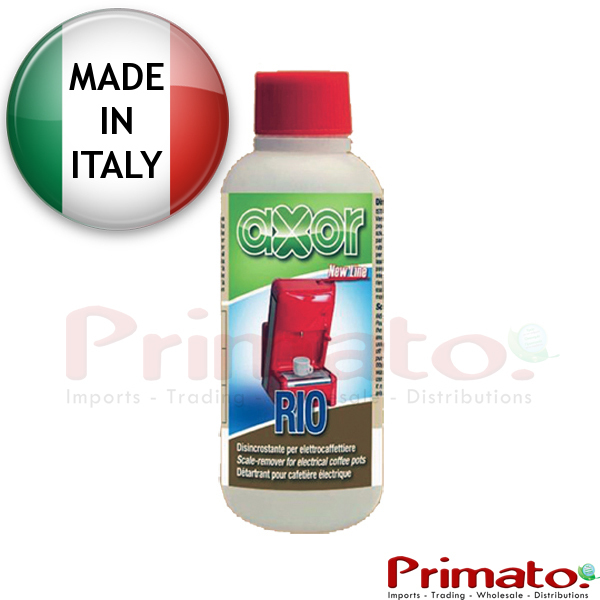 It is manufactured and packaged in Italy by Axor. Fill half a liter of water in your machine's tank and add 1/4 of the cleaner. Remove the machine handle and allow two glasses of water to run. Stop the water and leave the engine open for fifteen minutes. Then, re-open the water for two glasses of water. Repeat the process until the water in the tank is over. Rinse the tank thoroughly and fill it with clean water. If the machine is completely blocked by salt, allow the solution to run from the steam discharge system until you fill two glasses of water. Leave the engine open but without running water for fifteen minutes. Try to open the water normally. If it is again clogged, repeat the procedure. If it unglogges, let the water run for two glasses of water and repeat the first procedure.